The hungry crowd was outside waiting for the fundraising event to start at 6 p.m. at the Activity Center Saturday. So we opened the doors and started serving dinner early. Good deeds are done with charitable hearts, with no expectation of a pat on the back. Our family believes the actions of one person can make a difference in the world. On Saturday, the doors at the Activity Center located at 120 South Franklin Street opened early. There was a line of people gathered outside hungrily waiting for the Celebrity Chef Fundraiser to raise money in support of activities at the facility. My husband and I were anxious about the event, our cooking talents were on the line. A few hours before we talked about what we would do if no one liked the food. Well, my father requested I make his favorite dish, Grandma Iva’s secret recipe for homemade chicken and noodles, and Jason cooked up an unusual but very rich-flavored and tasty dish we call Drunken Gizzards. My father, who procured free ice cream for the event from Page’s IGA, and his special friend Alice were there. My dad even hit the dance floor a few times to take a spin with a few of the ladies. Other members of our family also stopped by as their schedules allowed to help out, including Joshua Jacobs and my two children, Olivia and Ovid Herron. Grandson Adrian aka “Booga” helped out the day before. Our friends Karen and John Meister, along with their son Iain, were there, too. She made seven-layer salad and Jay made the pumpkin pies as well as another diabetic dessert. Dear friend Pat Krider brought her locally famous lemon meringue pies and her husband Russ was an official taster. They both stayed to helped out throughout the event. Jeanne Burris brought a cake and passed out the door prize tickets while helping to serve drinks and do anything else that was needed. I want to also take the time to express gratitude for the “last-minute generosity” of our community. Whomever we spoke to about this fundraiser in the past month, the business owners immediately said yes to helping out with gift certificates. Thank you to our local restaurants Top Notch, Sunrise, Hardee’s, FiFi’s, Dairy Queen and to the Community Theatre of Clay County. Lynn’s Pharmacy and The Brazil Times also helped out along with several donations by people with very charitable and humble hearts who didn’t want recognition. You know who you are, and blessings upon you. If anyone was forgotten, we are sorry, but we are so grateful for everyone’s involvement in this hurried event. We had a couple of hiccups, minor things that went awry, but everyone took a deep breath and within minutes things were running smoothly again. Patience pays off, always. The menu, including the Drunken Gizzards, was a big hit. 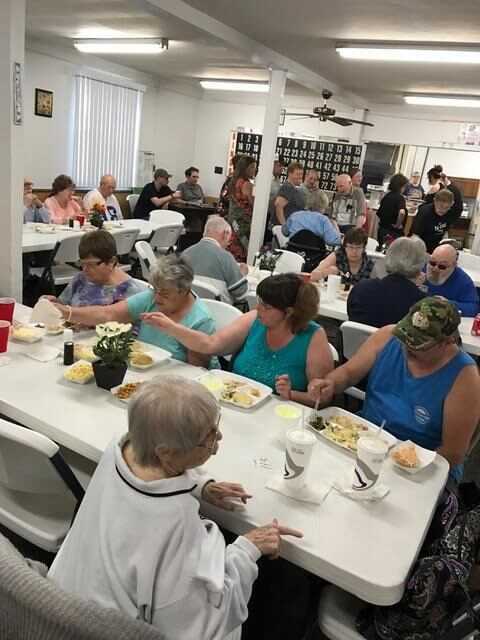 While we didn’t sell completely out, that was OK because we sent a lot of people home with dinners and desserts they could enjoy later or share with others whom might not have Easter dinner plans. We shared recipes and stories about the food prepared. Some people crinkled their noses at the thought of eating gizzards, but most tried them in the spirit of adventure and many were pleasantly surprised. When the band started to play, everyone was tapping their toes, clapping and singing along. Great job and thanks to Steve Manning, Mike Perkins and Bob Mason. At the end of the night, we presented Executive Director Sharon Brown more than $500, between the money raised and the various donations and supplies from our efforts. We also stocked the refrigerator with treats for the upcoming week. “Next time, let’s do Italian,” Karen said, as the plans for another event began to formulate and a rowdy rendition of Dean Martin’s “That’s Amore” echoed throughout the building as we cleaned up. If you are interested in joining our motley celebrity chef crew for another event in the future to help fund the Activity Center, contact us on Facebook. We’re kind of crazy as a group, but we do have a lot of fun. See more SNAPSHOTS online at www.thebraziltimes.com.